A pop-up card made with inspiration from my Gerbera Daisy plant. 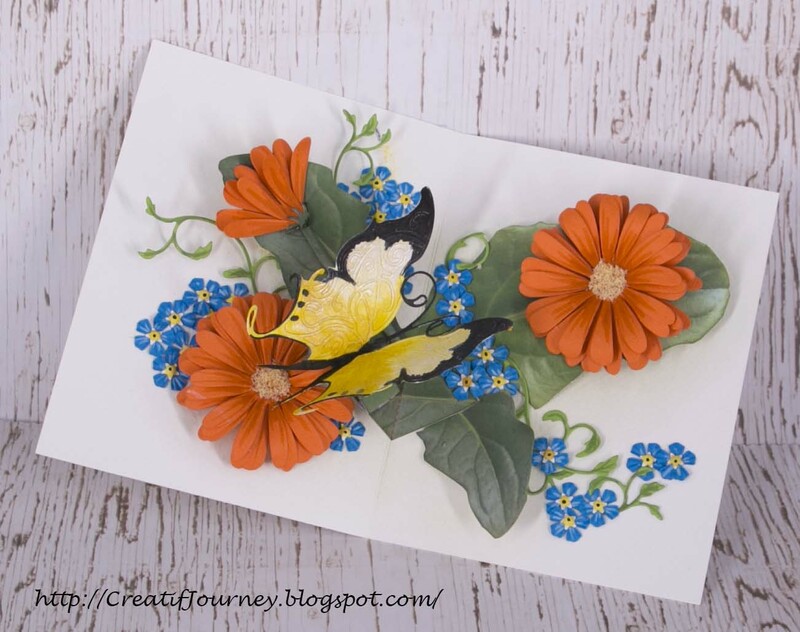 The card is depicting a common scene where butterflies will hover over my daisy (minus the Forget-Me-Not flowers). I don't remember seeing a real Forget-Me-Not plant and these are my take after researching the plant on the internet. Another angle of the card. 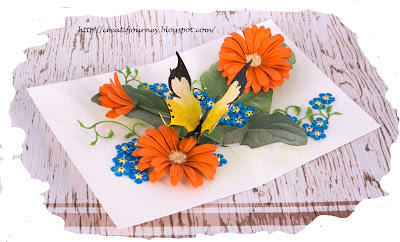 You can find the templates and instruction video in the Butterfly Daisy Pop-up Card Instruction post. WOW this is just GORGEOUS Mee! Thanks so much for playing in our ‘THE GREAT OUTDOORS’ challenge at Dies R Us! Please come back again soon! Beautiful pop up card! Love the colors! Thanks for joining us this week with Cheery Lynn Designs. Your forget me nots are perfect and I just love them in combo with the orange daisies. What a bright, cheerful, and pretty card! Thanks so much for sharing it in our Dies R Us Great Outdoors challenge! Your pop up card looks amazing! Love the colors; they are so bright and cheerful. So glad you shared it with us for the Scrapy Land Challenge. Love that beautiful butterfly on your lovely card! Love all your flowers too! Thanks for playing along with us at Scrapy Land Challenge #23! I love flowers and all of these with the lovely butterfly are so pretty. Thank you so much for joining us at Scrapy Land Challenge #23. What a lovely dimensional card! The bright colors catch the eye, and the butterfly on the flower is just like being in the garden. Thanks for joining us at Simon says Stamp Monday challenge! BEAUTIFUL!!! Love all the pretty colors, beautiful flowers and butterfly!! Thank you for joining us "Dies R Us" for our "The Great Outdoors" challenge!